This page shows gigs played during 2015-2017. For upcoming events, please see this page. Another great evening of music and dance with dance teacher Beverley Harwood - all helping to raise £1003 for cancer research. 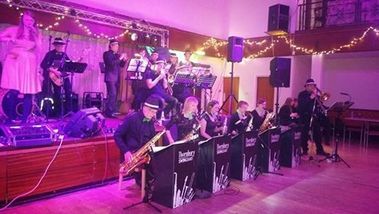 A fabulous evening of music and dancing was had at Easter Compton Village Hall. All proceeds from the evening went towards the upkeep of the All Saints Compton Greenfield church and graveyard. "Thank you so much for making my party swing last night. It was my best birthday ever." 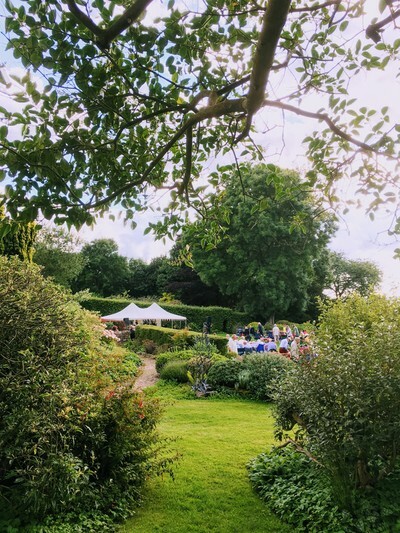 Swing Jazz & Summer Picnic at Camers, Old Sodbury. A return to the beautiful setting of Camers, helping to raise funds for Old Sodbury Church. After the June & July heatwave it was a shame that the rain couldn't hold off until after this event but those attending came prepared for a more traditional English summer evening and a good time was had by all. 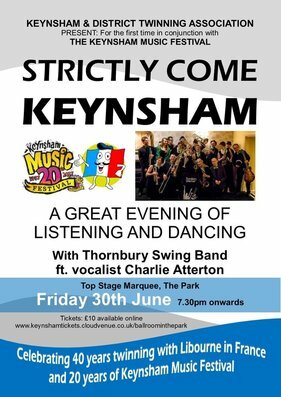 "It is difficult to put into words how wonderful last evening at Armstrong Hall was, everyone was so impressed with your musicians, and sure you could tell by the reception you had, that we all had a really great evening... AGAIN sincere thanks for last evening, your band is just excellent and a credit for all the ‘back room staff’ and all the practising and presentation to detail you all made. I sincerely hope we can book you again." Private Function - celebrating a wedding, St George's Hall, Bristol. Delighted to be part of the wedding festivities at the renowned St George's Hall, Bristol. 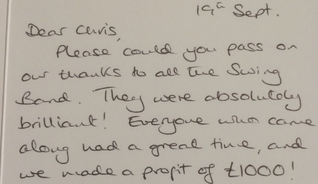 "A huge thank you for playing at our wedding in the summer. You were fantastic and really made the evening for us." 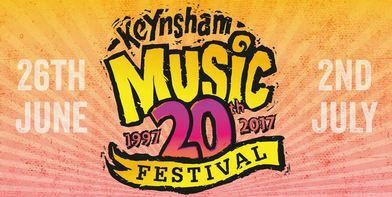 Keynsham Music Festival promotion details. Audience receiving some dance step instructions from teacher Bev Harwood. Note the band's rarely seen red polo shirts - much more suited to the heat wave! 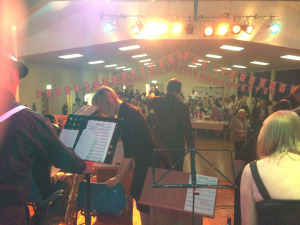 Another great evening at the annual "Swing for Victory" dance evening, raising funds for Holly Hedge Animal Sanctuary. 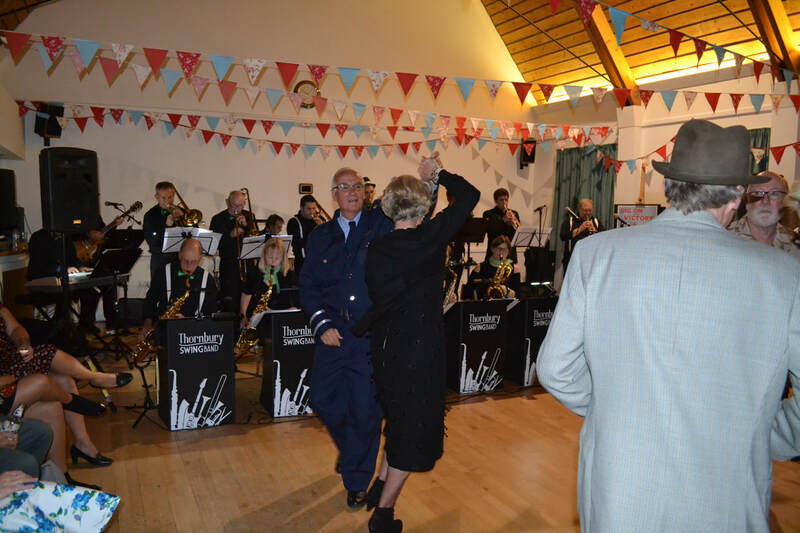 "Ginny and I really want to thank you for your wonderful sets at the VE Day Swing for Victory event in aid of Holly Hedge last Friday 18 May. Please can you pass on our grateful thanks to ALL the band. You're all superb and talented and seem to take it up a level each year which I didn't think was possible as you're just brilliant anyway! I thought the number you did (I think it's called "Sing, Sing, Sing"" was fantastic - probably my favourite and the audience seemed to really lap it up. I had a few people come up to me and say how great they thought you were." Tania, event organiser. Photos (more available) from here. 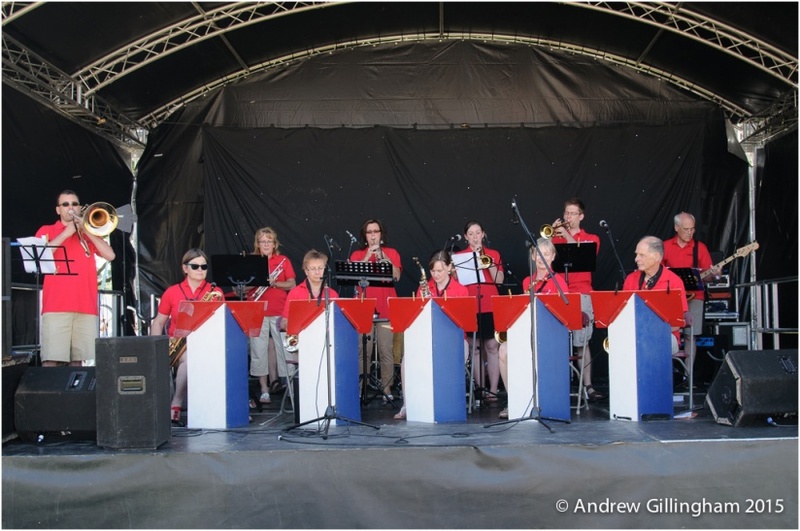 We enjoyed kicking off the 2018, and inaugural, Thornbury Jazz Festival with a punchy one-hour set with great big band tunes 'Splanky', 'Jumpin’ at the Woodside', and 'Cute'; and the Glen Miller classics 'Tuxedo Junction', 'American Patrol', and 'Chattanooga Choo Choo.' 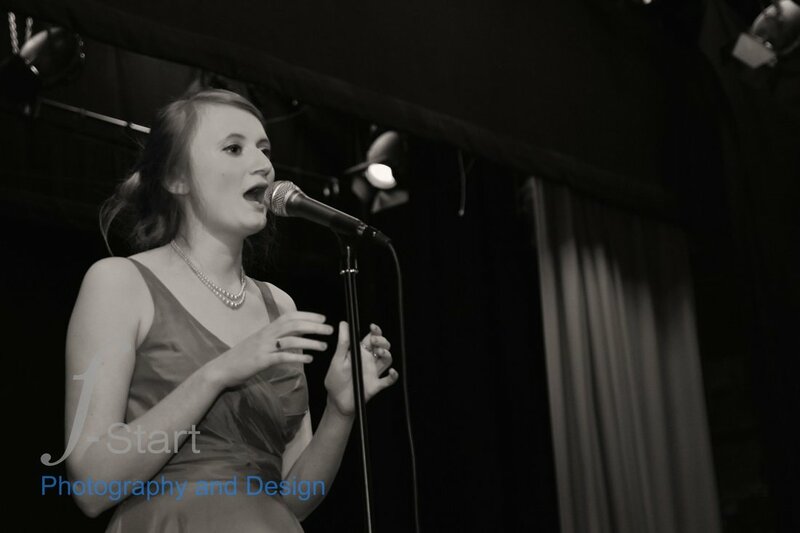 The last of these featured our fabulous vocalist Charley who was also kept busy singing 'Fever', 'Too Darn Hot' I’ve got you under my skin', 'Blue Skies', 'L-O-V-E', and 'Feeling Good'. The lively dance number 'Zoot Suit Riot' brought to an end our contribution to the evening, organised (superbly) as part of a series of events to raise funds for the Armstrong Hall Redevelopment Project. Charity Dance Night - Hamfields Leisure, Berkeley. 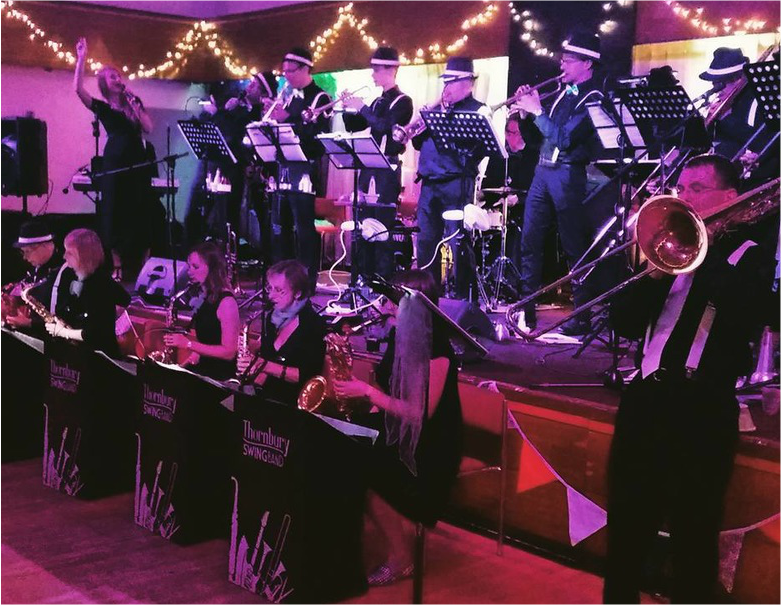 For the second year running, we were very pleased to support this charity dance organised and hosted by leading dance teacher Beverley Harwood - this year in aid of the RNLI 'Saving Lives at Sea' campaign, and raising the magnificent sum of £1201. Remembrance Dance - A 'Help for Heroes' fund raiser event at Hamfields Social Club, Berkeley. 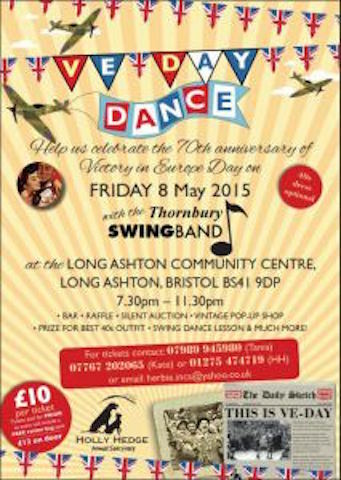 An evening of music and dance that featured Thornbury Swing Band and a disco, - all in aid of HELP FOR HEROES. The evening included a raffle and a prize for the best dancing couple with all money from ticket sales and raffle tickets donated to 'Help for Heroes'. A fabulous 1940s-themed evening raising funds for the upkeep of the churchyards in Easter Compton. 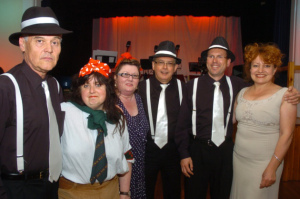 A great audience, dressed to impress in suitable 1940s style and dancing throughout the evening. Our thanks to Adam Dawkins for the pictures. An appreciative audience of 200, a lovely summer's evening and the beautiful setting of Camers - a perfect evening! Pictures show us setting up on the picnic lawn. 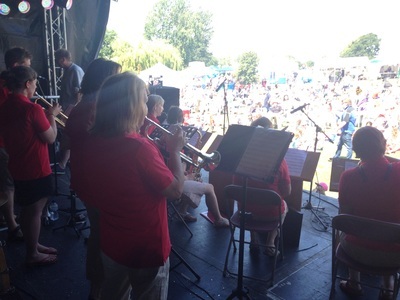 We were delighted to play at one of the top three UK free summer events - as nominated by Prima Magazine, Delighted too to help celebrate two birthdays: one, the festival's 20th anniversary and, two, the 40th anniversary of the twinning of the two towns of Keynsham and Libourne, France. Lots of French spoken and sung during the evening, including 'La Mer' - our own 'homage' to French singer, Charles Tenet. 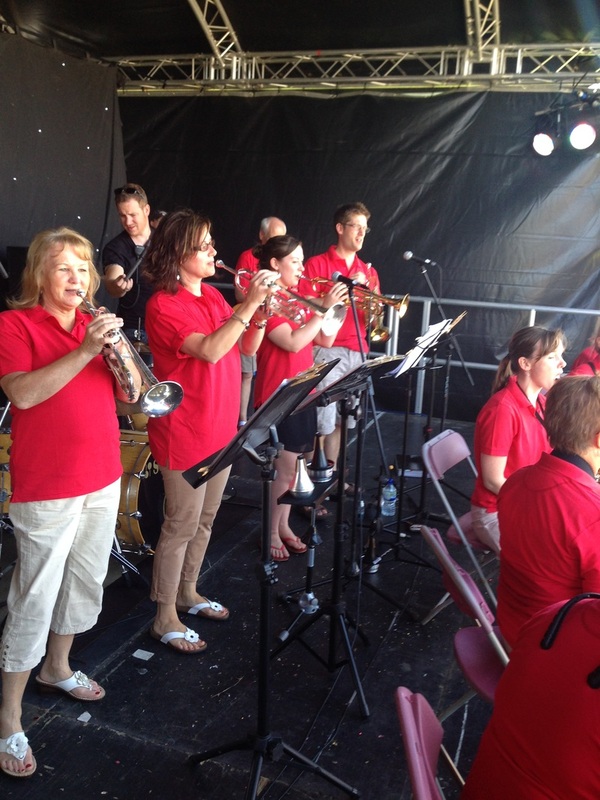 On behalf of Keynsham Twinning Association may I thank you for entertaining both the English and French at the music festival. Your music was great – it’s always a great pleasure to me, the type of music you played - especially Glenn Miller music – I actually was born the day he went missing 15th December 1944, I thoroughly enjoyed the dance. Thank you again for such a great evening at the festival. I hope we can do something again next year. 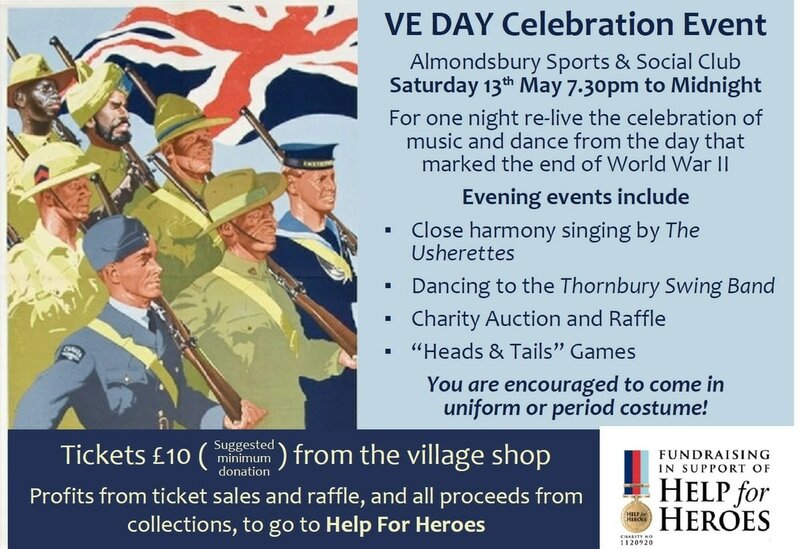 'Help for Heroes' VE Celebration Event - Almondsbury Sports and Social Club. A fab evening helping to raise funds in support of Help for Heroes. 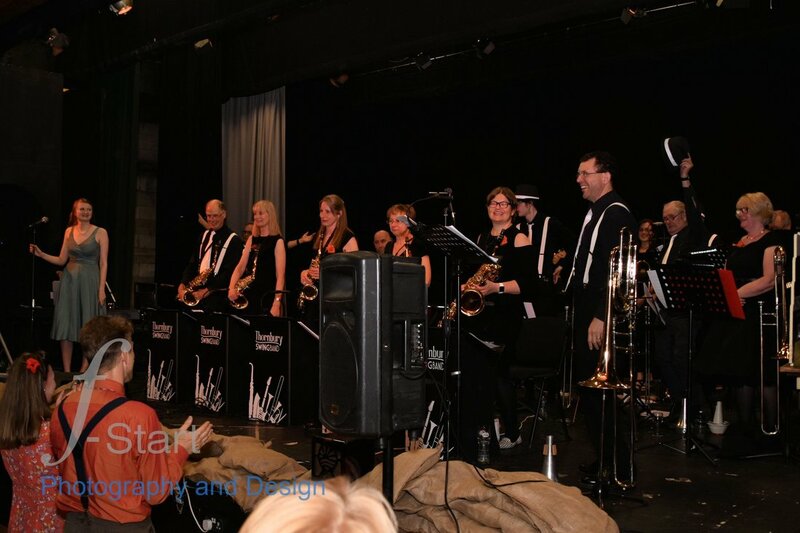 Dancing to the Thornbury Swing Band - us! 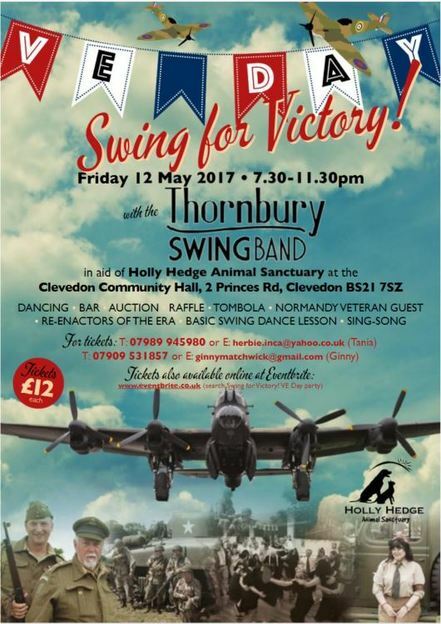 ​Another great VE Day party celebrating the end of World War 2, in aid of Holly Hedge Animal Sanctuary on Friday 12 May 2017. A HUGE thank you to you all for helping the event go with a swing! Ginny and I are thankful for all your wonderful help in making this VE Day event the best yet! We hope that you are all recovered by now?! The feedback we had was amazing. You went down a storm as usual and quite a few people came up to me to say how brilliant they thought you all were. Some have been coming along since the beginning of this event (4 or 5 years ago is it?) and have seen you evolve and all said that adding the singers was an inspired idea. A couple of times I actually got to sit down and listen which was so lovely. So here’s to next year! And we're especially pleased to say that we helped play our part in raising a whopping £5245.78 for Holly Hedge Animal Sanctuary! 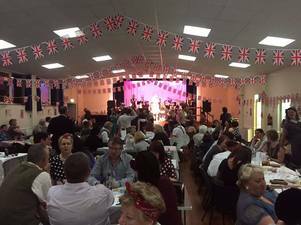 Thank you so much for all the wonderful entertainment you provided us with at our recent VE Day Dance Event in aid of Holly Hedge. 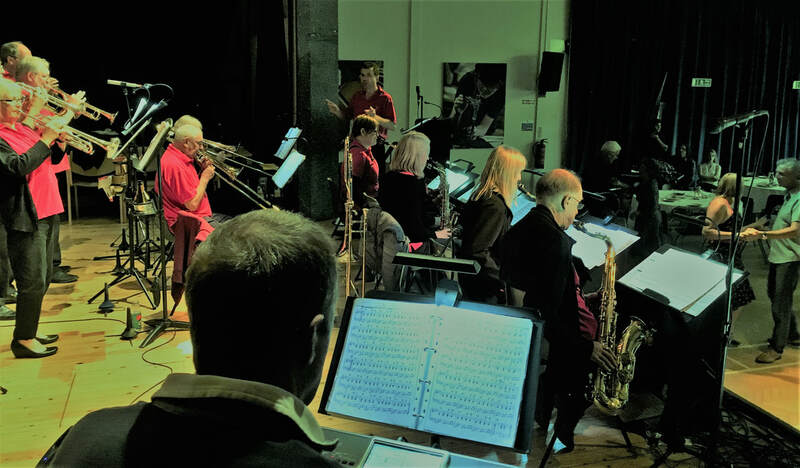 You really did do us proud once again, and we have had so much positive feedback from people who attended the evening and were full of praise for the excellent music, singing and dancing. 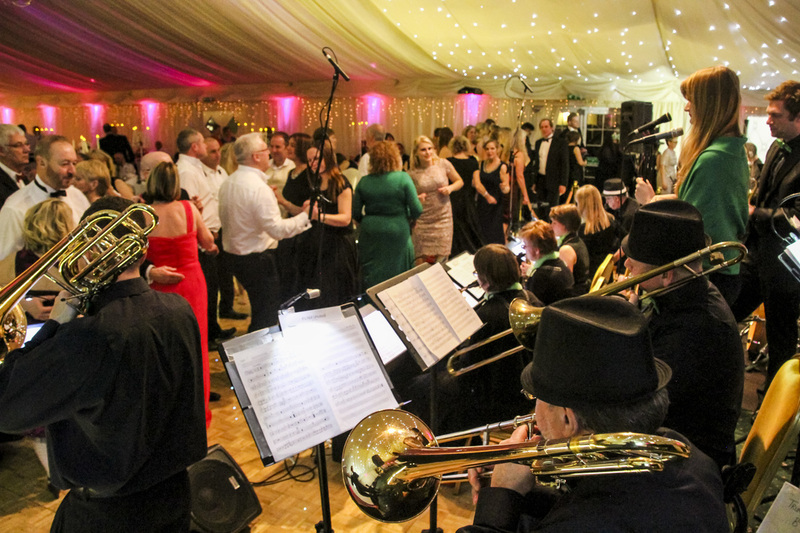 It was such a special evening and everyone seemed to be having such a fantastic time - in fact we had the feeling that many people would happily have continued dancing into the early hours! It really was a resounding success and we feel extremely fortunate to have had you performing on the stage. An incredible £5245.78 has been raised for Holly Hedge which will be of enormous benefit to all the dogs and cats in our care, who are patiently waiting to be chosen as someone’s ‘forever pet’. Huge thanks from them too, who all send lots of very grateful purrs and tail wags! Once again, thank you so much for your support. With very best wishes from Pauline and everyone here at the Sanctuary, both two-legged and four-legged! 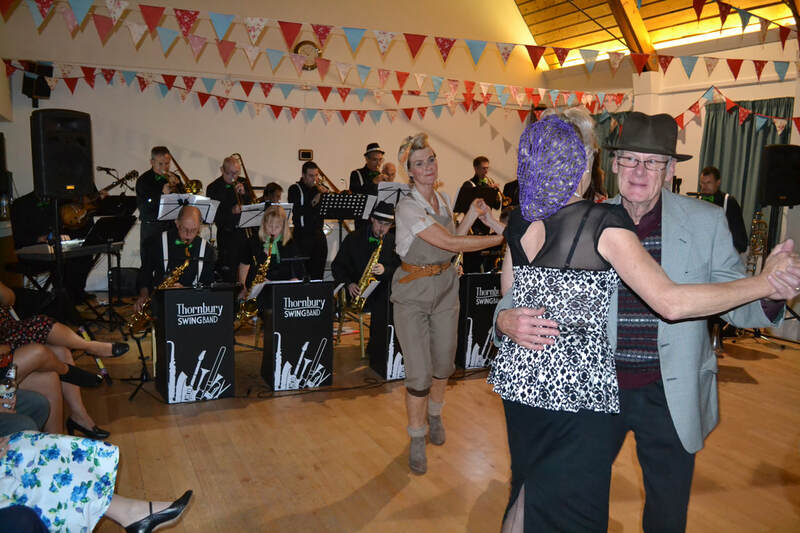 Inspired by 'Strictly', keen dancers from across the region came to dance the evening away with us on Saturday 25 February at Hamfields Social Club, Berkeley. 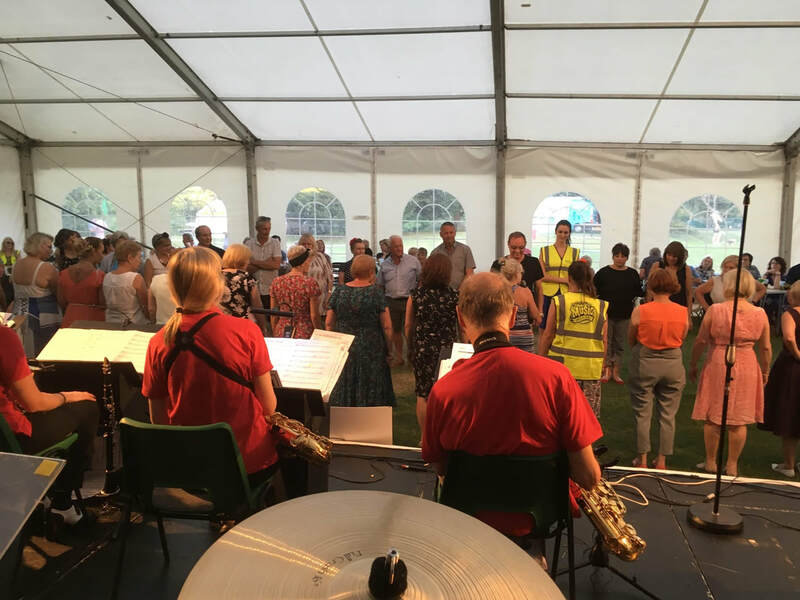 Brilliantly organised and led by dance teacher Beverley Harwood, we're delighted to say that the event was a sell out and succeeded in raising £1085 for mental health charity, MIND. I am sure you are all still shattered from last night. You all worked so hard to make the evening go with a "Swing'. I had many comments last night and also this morning about how fantastic you all are and that they enjoyed the evening. Please can you personally thank all of your band for me, for providing everyone with a truly memorable evening. Let's hope we can do it all again! Very pleased to play our part in helping to raise over £1000 for All Saints' Church, Stone. ​Thanks to all who came, to our 'deps', the The Broken Stones sound-crew (so good! ), and to the hard-working organisers. 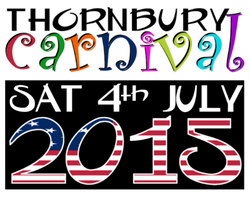 An evening of dance in aid of Holly Hedge Animal Sanctuary. We were pleased to be back again this year at this superbly organised and well-supported event. Great fun. Just wanted to say thank you so much for your participation in the VE Day party on Friday 27 May in aid of Holly Hedge Animal Sanctuary. Really appreciated it again! You all played a fabulous set as always... Looks like we raised around £3,000... So a brilliant amount!! So pleased! Many thanks once again. Please pass on our thanks to all the band. "Thank you so much for such a brilliant evening. The audience obviously absolutely loved the band, and Charlie and the other vocalists were amazing. The Festival Committee loved the evening and are absolutely determined to invite you back in the future." 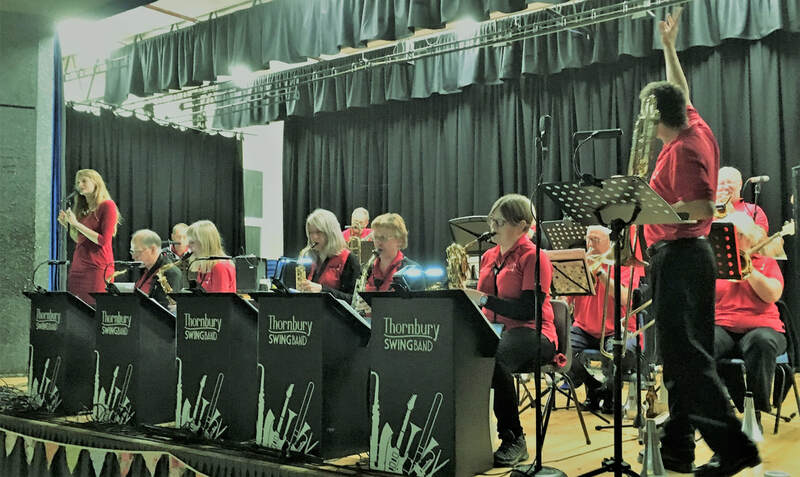 Thornbury Swing Band lit up the Armstrong Hall during the town’s Arts Festival thanks to a brilliantly performed set packed with favourites from the 1930s and beyond. 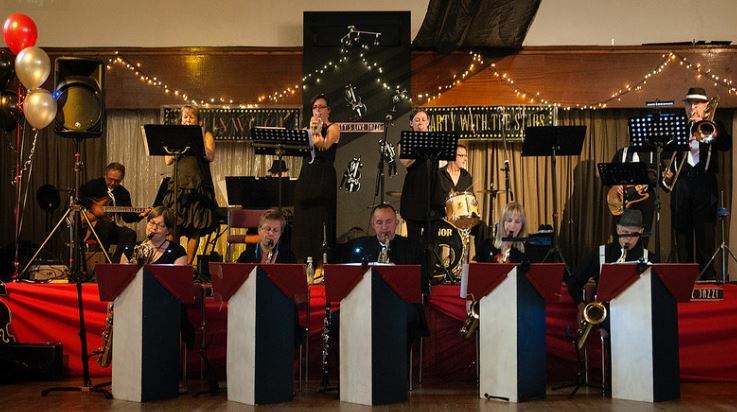 Musical director and trombone player Chris White-Horne admitted that some of their choices stretched the wartime theme somewhat – at one point, they ventured into the 1960s with a spirited version of It’s Not Unusual – but the vast majority of the evening was spent indulging in swing and big-band favourites. 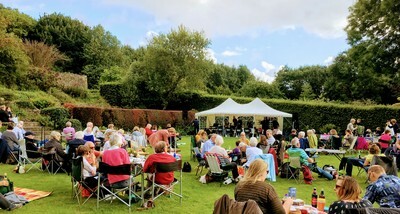 Vocalist Charlie Atterton was kept busy, regularly joining the band on-stage and – along with Will Swales - giving an excellent performance, particularly on Don’t Sit Under The Apple Tree. Glenn Miller arrangements featured throughout, including Chattanooga Choo Choo and Pennsylvania Six-Five Thousand, and there was even time for a tribute to the Queen’s 90th birthday via a rousing rendition of Rule Britannia. "Thank you all so much for such a super performance at the 'Liddy B Ball'. We have had such a lot of positive feedback about the sound and atmosphere you created. It was a joy to have you with us and we are extremely grateful for the hours of rehearsal you must have put in. 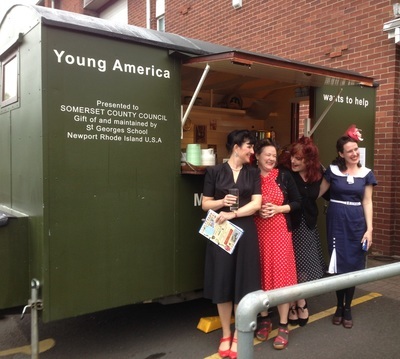 We are thrilled that the evening raised almost £3000 for Lydia's charity." ​We were very pleased to support such a worthy cause. A great evening made even more memorable by a wonderful audience. Thank you! ​More photos of the event on our Gallery page. We had a lot of fun at the fabulous Fleece in Bristol. Great to play at the superbly organised and well-supported Thornbury Carnival. Helping to make a memorable evening for students and teachers at The Castle School's Y11 Prom Night, at Berkeley Social Club. Please see our Gallery page for photos of the event. View from the stage as we set up. Maybe this should be a caption contest image!